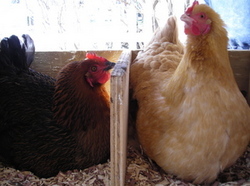 Posted on Wed, Feb 8, 2012 : 11:52 a.m.
Chelsea has ordered a couple to give up their backyard chickens or face a $500 fine and/or jail sentence, the Chelsea Standard reported. Chelsea doesn't allow chickens in the city on lots of less than 5 acres. Roen Montalva and her husband, Tim Farmer, received a letter from the city spelling out the order, the newspaper said. They have 10 days to comply. Chelsea allows chickens in some areas of the city but not on property of less than 5 acres. A group known as Chelsea Backyard Chickens is trying to change that. The City Council has discussed allowing chickens, but council members and City Manager John Hanifan have expressed concerns about the potential impact on city residents. Wed, Feb 15, 2012 : 3:01 a.m.
Thu, Feb 9, 2012 : 5:06 p.m.
Well, they should be able to keep a few chickens as long as they don't put up a split-rail fence! Thu, Feb 9, 2012 : 4:59 p.m. I'd rather listen to the gentle clucking of hens than the slew of barking dogs that currently provide the noise pollution in my neighborhood. Thu, Feb 9, 2012 : 2:11 p.m.
What a waste of taxpayer money. Too many damn laws and not enough freedom. Wed, Feb 8, 2012 : 11:03 p.m. Seriously? Looks Chelsea, get over it. Chickens are easy to maintain in a healthy environment. They do not attract new vermin and they don't require a rooster. They are not a health concern, in fact, they provide access to food that is way healthier than the store bought. Stop with the baloney. You look silly now that others have chickens and NO PROBLEMS with them. Wed, Feb 8, 2012 : 10:29 p.m.
Hello~ First, to Joe Kidd: as former chicken owners (we live in Scio Township on a full acre and were also recently ordered to remove our chickens), we are quite sure that you don't need a rooster to have eggs. Our hens were giving us a dozen gorgeous, low cholesterol, super nutritious eggs every day, while fertilizing our garden, eating our table scraps and acting as pets for our children, all without a rooster. They were fenced in and we had permission from all of our surrounding neighbors. Unfortunately, one neighbor changed her mind... At any rate, I wonder why dogs- who produce 6 more times excrement, often bark loudly and can bite- are allowed... Let's work together toward a law/variance that will allow these fabulous, productive animals space on our land/lots. Fri, Feb 10, 2012 : 9:54 p.m. Noise is not an issue with chickens. They cluck when they lay a egg, once a day. Dogs bark at anything at any time, yet neighbors aren't asked for their permission when someone wants to buy a dog. Smell? Dogs' excrement smells MUCH worse, and there's much more of it from one 40 pound dog than what 4 chickens produce. Chicken droppings break down into garden compost. Dogs' poop... just smells and gets on people's shoes. Guessing the neighbor that changed her mind didn't bother doing her research about chickens. Thu, Feb 9, 2012 : 7:11 p.m.
And why did that neighbor change her mind? Smell? Noise? There has to be a reason. Wed, Feb 8, 2012 : 10:27 p.m. Forget animal control, just throw a Weasel in the back yard. Seriously, my neighbor in AA has chickens and its a hoot hearing them cackling and klucking in the morning. They are not any louder than the Cardinals in my back yard. Do we call this Chicken disobedience? Fri, Feb 10, 2012 : 9:52 p.m.
Hens' clucking is at the same decibel level as a human conversation. Dogs barking? MUCH louder, and yet that's allowed? Wed, Feb 8, 2012 : 9:26 p.m.
Love folks who always think the laws don't apply to them.....chicken ownership isn't protected by the constitution. Fine them, put a lien on the property, and have animal control remove the chickens. Maybe the Governor will call out the National Guard if the city chickens out. The Michigan Right to Farm Act actually permits these residents and all property owners in the state of Michigan to raise chickens on their property, as long as doing so does not infringe on the rights of others and as long as they do their best to sell what is produced. Look up local laws before commenting next time. Thu, Feb 9, 2012 : 2:30 p.m. Wed, Feb 8, 2012 : 8:30 p.m. This is very stupid . . . Wed, Feb 8, 2012 : 8:27 p.m.
Not to rain on the &quot;Save the Chickens&quot; Parade. But until a city, village or town passes an ordinance (like Ann Arbor did), they have a right to disallow chickens in their jurisdiction. I am definitely FOR back yard chickens and people being able to keep them. But, unless you want to get fined and have them kicked out of town, you'd better petition for the right to have them. This situation is occurring all over the United States now as people realize that they want to be able to provide their own healthy, and hopefully chemical free food. Wed, Feb 8, 2012 : 7:57 p.m. Wed, Feb 8, 2012 : 7:55 p.m.
Fri, Feb 10, 2012 : 9:49 p.m. When a law is unjust and infringes on a person's personal property rights, then who is right, those who have to enforce an unjust law, or the rights of the property owner to raise hens and help his family become more self sufficient? Michigan's Right to Farm act defends this family's actions. The city of Chelsea needs to get on the ball and stop thinking of itself as this high-class resort town instead of the cute farm town it is. Wed, Feb 8, 2012 : 7:44 p.m. I guess the chelsea officials are lacking for things to do!! First they go after two farmers that have lights on their silos and now they are harrassing someone over a couple of chickens??!! I heard that the state of michigan is issuing a new License plate Just for chelsea citizens that reads, &quot;cluck free or die&quot;!!!! Wed, Feb 8, 2012 : 10:38 p.m. I don't think those farmers were in Chelsea. Maybe York or Freedom. Wed, Feb 8, 2012 : 7:37 p.m.
We need to start a telethon to save the chickens. I wonder if Pat and Vanna are available? Thu, Feb 9, 2012 : 5:05 p.m. I think they're at the bar. Wed, Feb 8, 2012 : 7:04 p.m. I fail to see how a few chickens could be so much more dangerous than assorted wild animals that don't obey no steenkin' zoning laws, much less domesticated cats and dogs. It's bad enough that we have to beg permission to keep a few hens in Ann Arbor. Wed, Feb 8, 2012 : 6:53 p.m. I am not complaining because I live in the country and there are chickens. To get eggs you have to have roosters, and gol darn, those roosters are very noisy. The ones I hear crowing are so far away I can't see 'em, but I sure can hear 'em. Thus I can see why the city of Chelsea may want to restrict them to large areas. If you have roosters living next door to you, your quality of life is going to suffer. Joe is in the country but not of it, apparently. Thu, Feb 9, 2012 : 1:41 p.m. Wed, Feb 8, 2012 : 9:30 p.m.
You know that age old question...&quot;Which came first, the chicken or the egg?&quot;...the rooster is never mentioned. Wed, Feb 8, 2012 : 8:24 p.m. They said it all...no rooster needed. Wed, Feb 8, 2012 : 8:09 p.m.
Oh Joe, eggs don't require males. Holy smokes. Wed, Feb 8, 2012 : 7:48 p.m.
Actually you don't need roosters to get eggs. You need roosters only if you want the eggs to hatch into baby chicks. Wed, Feb 8, 2012 : 7:03 p.m.
You don't need roosters to get eggs! You need roosters to fertilize eggs--not the same thing at all. Easy fix. Feed the council omelets made from the fresh eggs! So much better than store bought eggs, AMIRITE???? Soon they will degree that ALL properties have at least ONE chicken on the premises. Fri, Feb 10, 2012 : 9:46 p.m. Wed, Feb 8, 2012 : 6:15 p.m. This is an outrageous affront to food security and sovereignty. Wed, Feb 8, 2012 : 5:50 p.m.
Five acres, seriously? They're chickens, not cows fer cryin' out loud. Wed, Feb 8, 2012 : 5:37 p.m. Wed, Feb 8, 2012 : 5:32 p.m. Wed, Feb 8, 2012 : 5:26 p.m. Wed, Feb 8, 2012 : 5:28 p.m.
Why does Chelsea hate chickens? Wed, Feb 8, 2012 : 6:02 p.m. If they don't want chickens to be crowded and sad, they should ban all commercial chicken products in the city. They just want the chickens to be free range and happy. They don't want the chickens to be crowded and sad. Nothing worse than a sad chicken.